Time Zone: 3 hours behind Greenwich Mean Time. Argentina is a place of exceptional diversity and natural beauty, from the rugged glaciers of Patagonia, to the sprawling ranches of the Pampas, to the Northeast jungles filled with wildlife. Visit Buenos Aires for its mix of European sophistication and trendy Latin style. Kayak in a lake at the base of the Andes, or take a private boat right under the dramatic Iguazu Falls. There’s no end of fascinating places to enjoy or ways to keep active children entertained. I feel it’s one of the safest kind of adventure trips you can take – with no dangerous wildlife to fear, my kids ran around freely outside our estancia, and we all enjoyed finding our inner daredevil with light-adventure activities, like zip-lining in the rainforest. We went in December, to take advantage of the Christmas holiday, but there is really no bad time to visit Argentina. Every season offers something special: brilliant fall colors in the Lake District (March – May), polo festivals in Buenos Aires (November), huge flocks of butterflies at Iguazu (October – April). Argentina is generally affordable, but with the current exchange rate of 4-1, it’s especially so right now. The culture is very family-focused, which is a definite plus when traveling with kids. It’s also very cosmopolitan – the migration here in the first half of the 20th century has made it like a mini-Europe – and the hospitality is the best I’ve ever encountered. Another major advantage for us was our tour partner, Loli. She customized the trip according to our interests, hired specialists for our mild adventure tours, and shared with us her love for the country. Whether we were rappelling down a waterfall, hiking a glacier, or camping by a mountain lake, we always felt secure and well cared for. 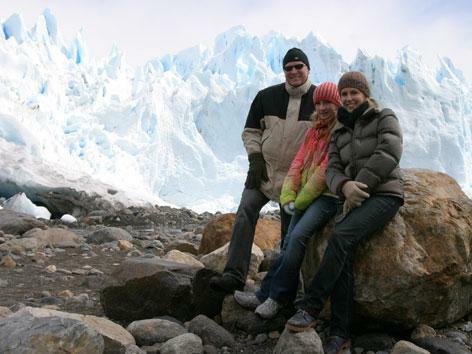 My children loved our trip to Argentina, and they all want to go back.